Fast-acting formula! Our Nourishing Eye Serum is designed to be absorbed quickly by your skin so you can see and feel the age-defying benefits fast. All certified organic ingredients! We use only the finest and purest organic plant oils which make our Nourishing Eye Serum gentle and effective for even the most sensitive skin. A little goes a long way! 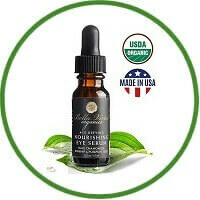 It takes only one tiny drop of this eye serum morning and night to enjoy smoother and suppler skin.